I rarely make mussels at home, yet it is so easy to do and they take such little time to prepare! The aromas of the sauce, whether it be curry based, tomato based or wine based, is enough to titillate the senses and stimulate those salivary glands. Here is a BC Living mussel recipe that uses a splash of Clamato for flavour. Clean the mussels well and discard any open ones that do not close after a slight tap on the shell. Set the cleaned mussels aside. In a large pot, heat the olive oil. Add the diced shallots and minced garlic and sauté until soft. Add the chopped parsley, diced tomatoes and prepared horseradish. Reduce the heat to low and cover the pot with a lid. Maintain the heat on low for 5 minutes. Add the wine and the Clamato juice to the pot and bring mixture to a boil. Add the cleaned mussels and steam for 4 to 5 minutes, removing each mussel as the shells open and transferring to a large serving dish. Cover the mussels and keep warm. Bring the liquid to a rapid boil with the lid off and reduce liquid by half. 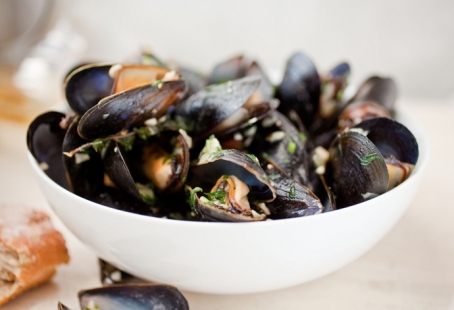 Pour the sauce over the cooked mussels and serve immediately.